46 days to go. The intensity of the training is ramping up. Two 16-mile long runs are already behind me, and my tune-up half marathon is in the books. I am still healthy and, for the most part, running fast and pain free, but fatigue levels are high, and the upcoming weather — unseasonably hot and humid until the end of September — does not bode well for future training. So does that mean I’ve got those little town blues? Let’s hear the tune those long runs are singing. 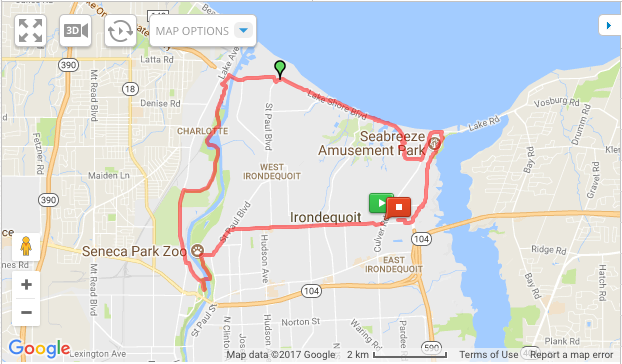 an easy two-miles down Seabreeze, a tough mile up into Durand-Eastman Park, then five relatively flat miles out to the O’Rourke Bridge followed by the long four-mile climb up the Genesee River Trail with four flat, but shadeless, miles along St. Paul and Titus to finish. With an overall pace of around 9:09 mins/mile over a 611 feet elevation gain, the run was a little on the slow side, though that’s what long runs are supposed to be. The same route, but an entirely different result. Unlike its predecessor, this was an afternoon run with the temperature in the low 80s. Also, unlike its predecessor, my fueling wasn’t adequate. So, it should come as no surprise that after a strong ascent up the River Trail, I crashed and burned around mile 13. Three tough miles at over 11 mins/mile in the baking heat of Titus Ave turned my brain to mush, and the final 9:45 average page was better than I deserved. Physically, I was pushing it a bit to run my tune-up half so soon after a long run — mentally, too, as the memory of the last four miles was in the back of my mind as I crossed the start line. But a little experience, in the form of a good game plan, always goes a long way. The strategy was simple: nail the first two miles at my 8:50 mins/mile race pace, take advantage of the downhill section of the trail and push it a bit, run the Thomas Ave hill slow and steady, then move into third gear at the halfway mark and see what happens. The results speak for themselves. I achieved my nominal goal of a sub 2-hour run by coming in at 1:56:31 — not my fastest run over the distance (my sixth fastest in 11 runs to be pedantic) — but my fastest since March of last year. 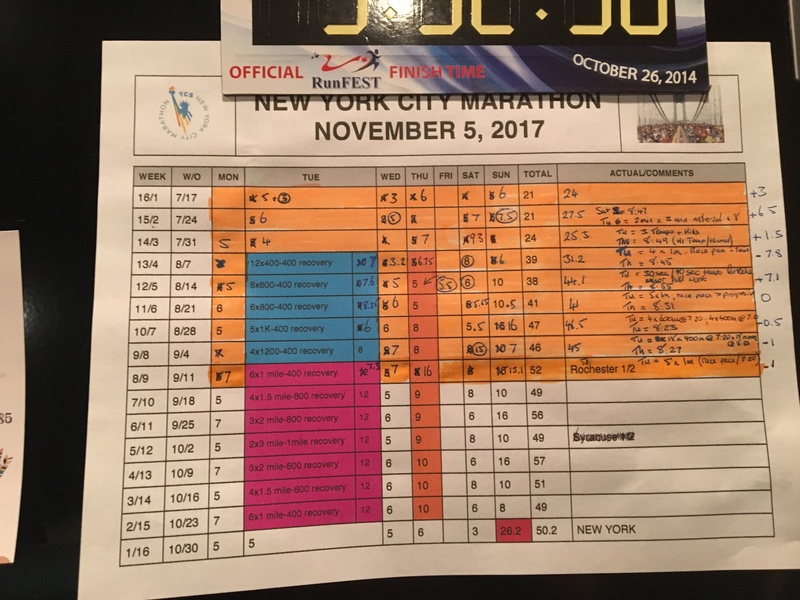 And given that the temperature on that day crept up through the 70s as I was on the course, and the course elevation gain is 786 feet (the New York Marathon course, by comparison, is 614), I was more than pleased with the result. Bruce: 2 – Long Runs: 1. These little town blues? Not so much, Frank. Not so much. Now for a little recovery, then onward to Week 10. The adventure continues! Send me your thoughts and I’ll feature them in the next Vagabond Shoes. 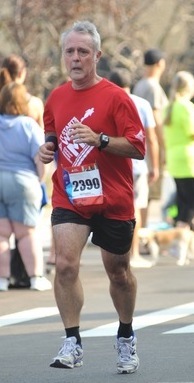 This entry was posted in The Flat-Footed Fox, Vagabond Shoes and tagged Episcopal Relief & Development, Hanson's Marathon Training, long-distance running, marathon training, Rochester Half Marathon, Rochester Running Co., TCS New York City Marathon, virtual training. Bookmark the permalink.